WHAT IS BEATLE STYLE LTD? My company (Beatle Style Ltd, registered #10371547) is based in Hove, Great Britain. We specialise in high quality ‘Beatle’ clothing which is 100% made-to-measure. “Beatle Style Ltd” is not endorsed by or affiliated with Apple Corps Limited or The Beatles. HOW LONG DOES IT TAKE TO MAKE MY JACKET OR SUIT? From start to finish it takes less than 30 days. It takes approximately 10 days to tailor-make your suit and then 4-7 days to ship it to your home or office, so it can be faster than 30 days but it really depends on the type of fabric and the details you have specified. Your suit will be sent by fully tracked DHL International Shipping. Absolutely everything is 100% custom, tailor-made using a unique system that guarantees a perfect fit. We ask you to spend 15 minutes to obtain a set of unique personal measurements (for a jacket: chest, shoulders, waist, hips, jacket length and sleeve length…for a suit add: trouser waist and hips, inside leg, outside leg, thigh and hem…for a shirt add neck size) and we make your clothing exactly to your sizes. 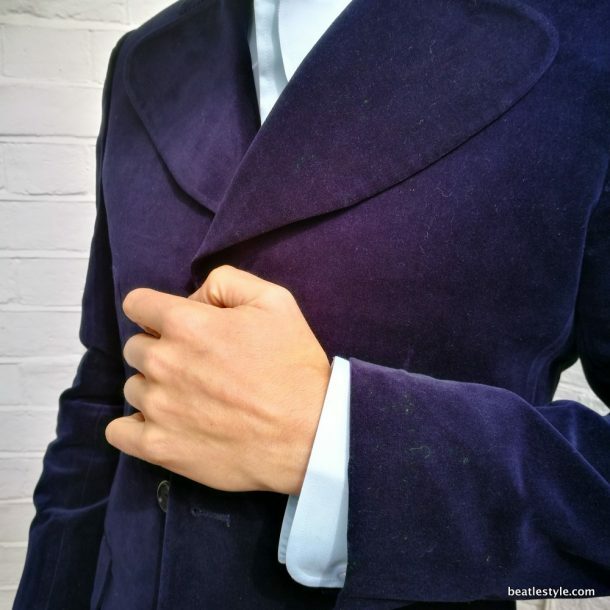 It is therefore extremely important that you take your measurements carefully because your jacket, shirt or suit will be made exactly to the measurements you supply (obviously we add to your actual chest, waist and hip sizes, depending on whether you prefer a slim, regular or loose fitting). The best way to provide your measurements is to complete the online form HERE. Alternatively, you can DOWNLOAD detailed instructions and send back your measurements by email. Please note that should you prefer to order a standard size we can tailor-make your suit according to your favourite standard suit size. Just choose this option when ordering. Remember, this is essentially an online custom tailoring order which means we can offer no second ‘fitting’ or modification after you have received the clothing. That said, we genuinely do have a 100% satisfaction record (with many, many testimonials to back this up), so if for some reason you are not completely satisfied with the clothing you have received, you can return it within 30 days of receipt for a full refund* (just please cover the cost of return shipping). *When you complete the ‘Your Measurements’ form, you will receive a copy of your data – please check them carefully because my ‘money back guarantee’ is based on these measurements being correct (according to the instructions given on my website). If you want to amend anything / ask any questions, please just send an email to help@beatlestyle.com asap. Unless you spot an error with your supplied measurements, or I have any clarifying questions on your supplied measurements, I will get started within 5 days and you’ll have your new gear within 30 days! Trust us, if you obtain the measurements exactly as we specify, you will be delighted with your suit and will be back for more! (by the way, unless you tell us otherwise, you only need to measure once because we keep your measurements on file for any future orders). I AM WORRIED I WILL MAKE A MISTAKE TAKING MY MEASUREMENTS, WHAT CAN I DO? Although providing our required measurements takes just 10-15 minutes, we’ve been asked if its possible to get help. So we introduced a new service: walk into any local tailor, wherever you live, and ask him to help measure you up according to a sizing document that you can get from this website. We will then give you a discount of £20 (hopefully this is enough to cover the cost of the tailor’s time). Then you send us your measurements and we make your suit. Alternatively, if you send me a well-fitting suit (or separate trousers and jacket, they don’t need to match), then I will copy the sizes and make you a suit that fits you the same way. I will then deduct the cost of postage from your order. Please email me to get my full mailing address. CAN YOU MAKE MY SUIT EXTRA SPECIAL? CAN YOU MAKE A BEATLES SUIT FOR MY CHILD? Yes I can, just try to get me as many of the measurements as you can using this form. I understand if you cannot get all of them, but the more the better. I give a discount for children’s clothing, drop me a line for details. More products will be added to this site over time. Please get in touch if you have any questions at all about any item on this site. CAN I SEE SOME PHOTOS OF THE CLOTHES? There are some on this website and if you send me an email I will respond with some more photos of whichever item you are looking for.